This is the 21st square of the 30 square Knitterati Afghan. The afghan commemorates Cascade Yarns® 30th anniversary. The 30 squares will be released throughout 2017 as a mystery knit-along. 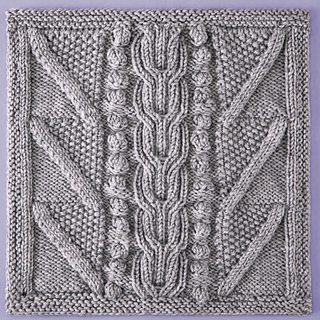 An array of textured patterns formthe main square, which is framed by garter-stitch borders. 20 sts x 26 rows = 4” (10 cm) over Stockinette Stitch using size 7 (4.5 mm) needles. 20 sts = 3” (7.5 cm) x 32 rows = 4” (10 cm) over right or left diagonal panel using size 7 (4.5 mm) needles. For additional tips and helpful videos for this square visit: Cascade Yarns Block 21 Project page.